A Russian Soyuz rocket carrying NASA astronaut Tim Kopra, Russian cosmonaut Yuri Malenchenko and British astronaut Tim Peake - the United Kingdom's first space station astronaut, launches into orbit from Baikonur Cosmodrome, Kazakhstan on Dec. 15, 2015. This story was updated at 3:30 p.m. EST. Two experienced fliers and a space newbie — the first British astronaut to visit the International Space Station — launched spaceward on a Russian rocket today (Dec. 15) to begin a six-month science mission on the laboratory in orbit. Russian cosmonaut Yuri Malenchenko (top), NASA astronaut Tim Kopra (center) and British astronaut Tim Peake of the European Space Agency wave farewell as they board their Soyuz rocket for a launch to the International Space Station on Dec. 15, 2015 at Baikonur Cosmodrome in Kazakhstan. The trio launched on a six-month mission to the station. 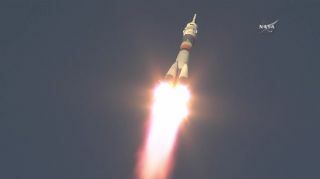 At 6:03 a.m. EST (1103 GMT) today, American astronaut Tim Kopra of NASA, British astronaut Tim Peake (of the European Space Agency) and Russian cosmonaut Yuri Malenchenko lifted off from the Baikonur Cosmodrome in Kazakhstan on a 6-hour journey to the space station. Malenchenko, a veteran of six spaceflights (including trips to the station as well as to Russia's Mir space station), is commanding the Soyuz TMA-19M spacecraft. The crewmembers are part of Expedition 46 mission to the International Space Station, and will remain onboard for Expedition 47. British astronaut Tim Peake of the European Space Agency gives a thumb's up sign while launching to the International Space Station on a Soyuz TMA-19M spacecraft on Dec. 15, 2015. He is the first U.K. astronaut to visit the space station. Malenchenko took manual control of the spacecraft after the automated docking attempt was unexpectedly aborted and successfully docked with the station's Russian segment at 12:33 p.m. EST (1733 GMT). The hatches opened to admit the crew into the space station at 2:58 p.m EST (1958 GMT). The new crewmembers join current space station commander and NASA astronaut Scott Kelly and Russian cosmonauts Mikhail Kornienko and Sergey Volkov. Kelly and Kornienko are a few short months away from the end of their one-year space mission. When the trio departs in March, Kopra, a veteran of one previous space mission, will take over as commander. The mission is Peake's first time traveling to space, and he will also be the first British astronaut to live aboard the space station. "The U.K. has always been part of the European Space Agency, but only recently has it been part of the Human Spaceflight Program," Peake said during a news conference in September. "And that really opens the door for Great Britain; it opens the door in terms of the scientific community that can now enjoy participating in the scientific research we do onboard the space station. It also opens the door for U.K. industry to become involved in some of the engineering and technological work that's being done onboard the space station." The three Expedition 46-47 crewmembers — Yuri Malenchenko, Tim Peake and Tim Kopra (left to right) — play chess during training. Only three men alive know who won this match… and they're not telling, because they've got more important things to do. They're in space. During the news conference and in later interviews, all three of the crewmembers talked animatedly about the science they'll get to perform while aboard: projects that will span human research, biology and biotechnology, astrophysics research and physical sciences, NASA officials said in a mission summary. Peake particularly called out a medical research task, where they will grow crystals from disease-causing proteins in microgravity. Because there is so little to disturb the protein growth, they will be able to grow large, pure crystals to investigate drugs that can counter them. Kopra mentioned the research on the astronauts themselves — a staple of space station investigation. For one, the astronauts will photograph their eyes to investigate how they change in lowered gravity, and they will also take ultrasounds guided by ground personnel. The crew will also have a chance to observe the Earth's atmosphere and ionosphere from afar and compile data, as well as install a furnace into the Japanese module and investigate flame combustion. Plus, they'll test out an inflatable capsule that could someday be used as a portable habitat in low-Earth orbit, on the moon or on Mars. Malenchenko said he's looking forward to working with the crewmembers from the one-year mission because of their extensive experience. The veteran crew will be able to support the new arrivals, but the three newly arrived astronauts will also be able to bring new energy to the tasks. "It's going to be a very interesting mission," Malenchenko said through a translator. "We're going to have several EVAs [spacewalks], and it's going to be a very intense research program. […] Every spaceflight is a very interesting flight, and in this case, it's going to be a particularly interesting mission."